College of the Ozarks hosted the NAIA #21 ranked Central Methodist Univeristy Eagles for a chilly doubleheader on Saturday. Unfortunately, the Bobcats dropped both games on Saturday to move to 3-3 on the season. In the first game of the day, the Bobcats were opposed by the Eagles’ left-handed senior ace Kyle Fulton and countered with a senior of their own in Jay Kaufman. Kaufman struggled out of the gate walking the first Eagle he faced. Central Methodist strung together a pair of hits and a sacrifice fly to take a 3-0 lead. The Bobcats failed to strike back after an inning-ending double play to close-out the first frame. The top of the second inning started with Kaufman beaning the lead-off batter. 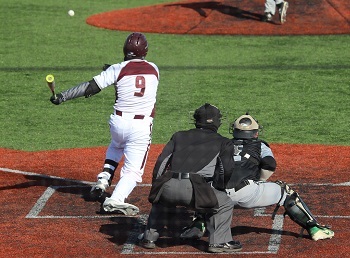 The Eagles used a pair of bunts to set the table for two more runs. However, the Bobcats successfully countered in the bottom of the inning on a solo shot by Westin Gann (2-3, RBI, homerun, double, run) off the scoreboard to trim the lead to 5-1. 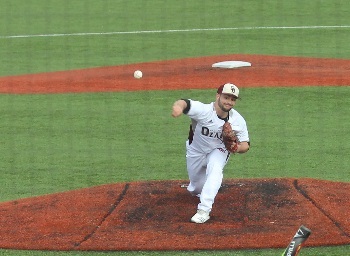 Kaufman settled in and held the Eagles scoreless in the third, fourth and fifth inning. In the bottom of the fifth, Westin Gann drilled a double to deep centerfield. Not to be outdone, Kolton Giefer (1-2, homerun, RBI, run) nailed a two-run shot off the scoreboard to make it a 5-3 game. Unfortunately, that was the last time the Bobcats would be able to strike the scoreboard for the rest of the day. The Eagles tacked on two more runs in the sixth inning to take game one 7-3. Fulton was credited with the win for the Eagles and Kaufman the loss. Game two featured Bobcat ace Collan Thrasher against a transfer student for Central Methodist in Peyton Long. Both pitchers threw a very economical game, settling in from the start for two quick innings. Thrasher was met with his first challenge in the third inning after a blooper fell in centerfield. A sacrifice bunt and a timely double to right centerfield gave the Eagles a 1-0 lead. A solo shot over the leftfield fence amounted to the only other Central Methodist run. Thrasher allowed three hits, giving up three runs in a 74-pitch complete game loss. The Bobcats were only able to scatter three hits of their own for the game. After five innings from winning pitcher Peyton Long, Central Methodist brought in reliever Sergio Macias to close-out the game with a two inning save. The Bobcats return to action February 12 at Rogers State University (Okla.) at 1:00 PM.